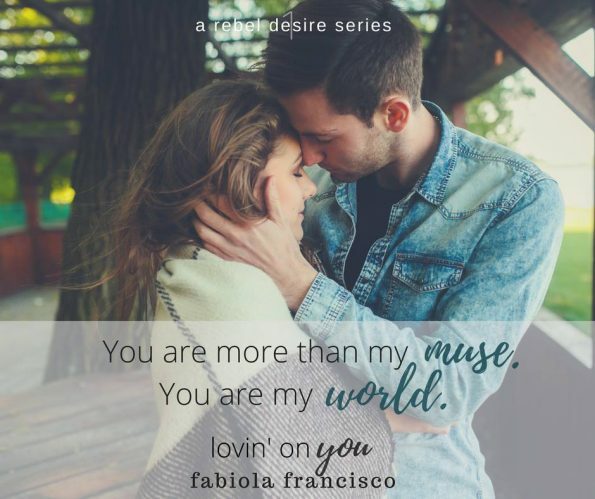 Review – Lovin’ On You by Fabiola Francisco – 4.5 Stars!!! Life in the limelight can attract all kinds of people, especially those believed to have been left long in the past. Will the past, destroy the relationship Cash Knight and Olivia Young have, or will love, win in the end? This is the first of Fabiola Francisco’s books I have read, and I was not disappointed. Fabiola writes with emotion, you can feel the love, passion, strength, and heartache, within her words, she truly brings the characters to life. Her talent for the song lyrics within this story are magical, I would have loved to have heard the songs for real. I look forward to reading more of Fabiola’s books. Lovin on You is a sweet romance, with a little added humour, and plenty of sweet dreamy moments, that had me captivated from the beginning. Fabiola Francisco brought to life an array of intriguing characters, each having their own unique traits that each stole a piece of my heart. Cash Knight without a doubt stole my heart, and soul. He had me swooning, and feeling weak at the knees, constantly. His music is beautiful and the passion he put into his music was outstanding. He was a great friend to his bandmates and a great pillow of support for them too. Olivia Young is feisty, clever, strong, and supportive. She would drop everything to help a friend and always supported those around her. She would do anything to protect those she cared about. Lovin on You was a delightful story, one that was hard to put down. If you enjoy reading romance stories with loveable characters and a little added passion, this story is for you.